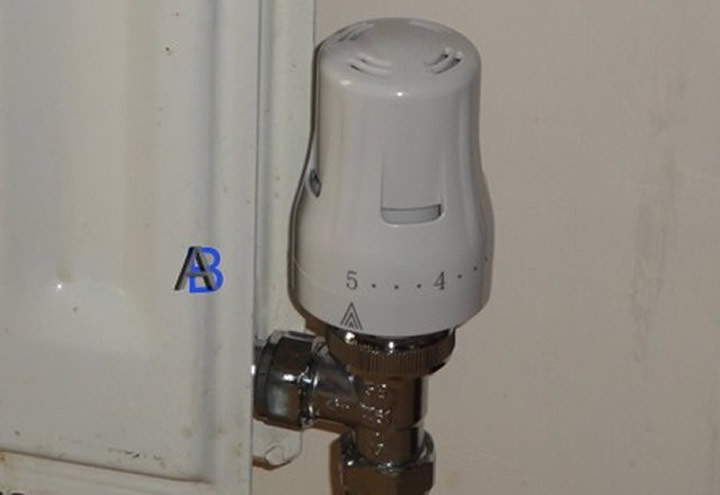 Thermostatic radiator valves allow you to get a comfortable temperature in all rooms, by sensing the air temperature and adjusting the valve accordingly. This can also save you money and cut CO2 emissions. 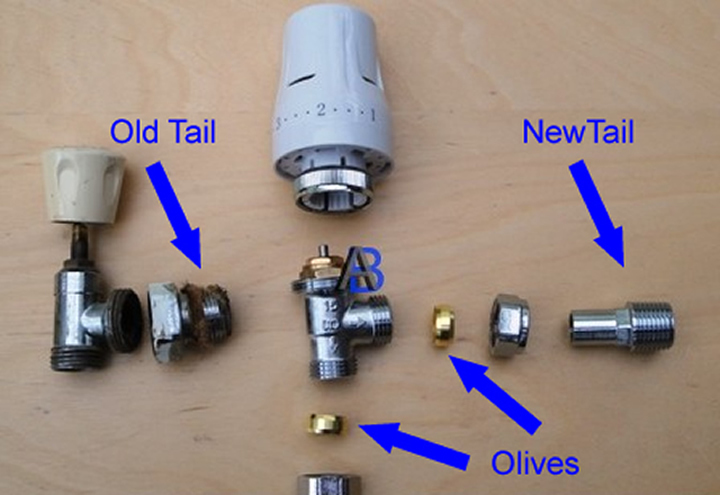 Most thermostatic radiator valves are bi-directional and can go on either the in or the out of the radiator, but always check with manufacture before fitting. The first job to do is to drain the water from the system, if you are not sure about doing this see Draining Central Heating Systems. You will need an adjustable spanner, pair of grips, bleed key and possibly an Allen key and ring spanner to change the radiator tails. 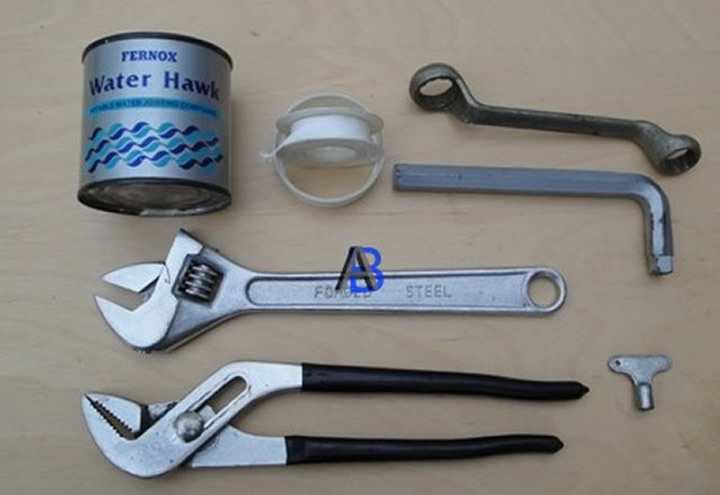 You will also need some plumber’s water jointing compound and some PTFE tape. When undoing or tightening the valve, always support it with a pair of grips to prevent damage to the pipe work (see picture below). You may find that you need to change the radiator tails (see first picture), this may require an Allen key or ring spanner to remove and refit, be sure to use some PTFE tape on the threads of the tail when refitting. Also be sure to use plumber’s water jointing compound on the olives (see first picture) to prevent leaks. Once the valve is fitted the system will need bleeding, if you are not sure about doing this see Bleeding Heating Central Systems. Can I fit Thermostatic Radiator Valves (TRV) on all radiators? 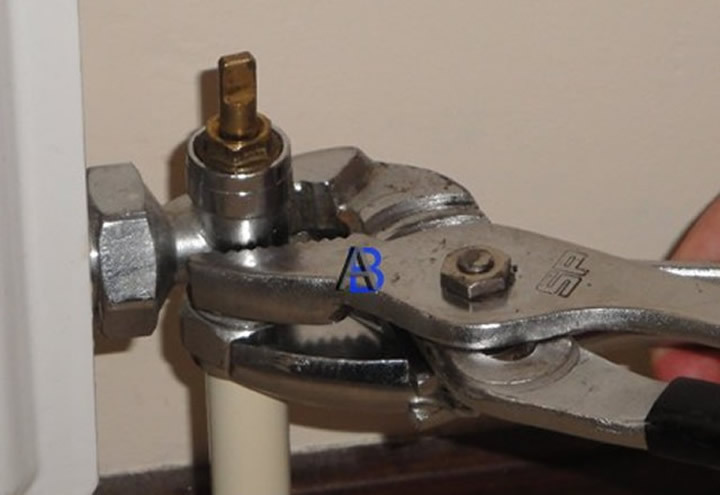 You should never change all the valves to TRVs, although new houses may have this, because of new housing laws, they will also have an AUTOMATIC BYPASS (PRESSURE BALANCING) VALVE, or ABV fitted to the system. The reason is that if all the valves are shut, the boiler would keep cycling and since the circulating pump would still be running, the pressure in the system would increase. Example you would not normally fit a TRV to the bathroom. Tip! always keep the plastic shut-off caps that come with the new valve in a safe place, these allow you to shut off the radiator if you need to remove the radiator at a later date. Most TRV valves do not shut of completely only shut off to a frost setting.